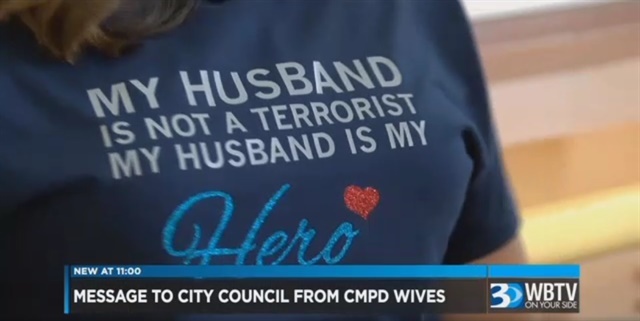 On Wednesday night during a Charlotte City Council Meeting some wives of Charlotte-Mecklenburg police officers expressed their displeasure with Councilwoman LaWana Mayfield who tweeted out that police are "terrorists." Mayfield, a Democrat who represents west Charlotte, posted on Twitter saying: "Being Black in America under #45 has created homegrown terrorist wearing blue uniforms." The tweet struck a nerve within Charlotte’s law enforcement community. Anne Steppe, the wife of a CMPD sergeant, wanted to make Mayfield aware of the community’s feelings. “My husband is not a terrorist. Our spouses of these fine people sitting here are not terrorists,” said Steppe during her speech Wednesday night. She referenced the other wives in the crowd. Many of them wore t-shirts inscribed with the phrase: “My husband is not a terrorist. My husband is my hero,” WBTV reports.